1. Buy Farm Rich Mozzarella bites at your local Walmart. 2. Follow cooking instructions on box. (I cooked mine in the oven- 9-10 minutes at 350 degrees). 3. While mozzarella bites are cooking, cut up fresh basil and tomatoes. 4. When mozzarella bites are done, put a small amount of basil on top of bite, topped with half a slice of tomato. 5. Drizzle olive oil (and Balsamic Vinaigrette if desired) on top. The plate on the right has the balsamic vinaigrette on it, the other two plates have just olive oil. Both delicious! 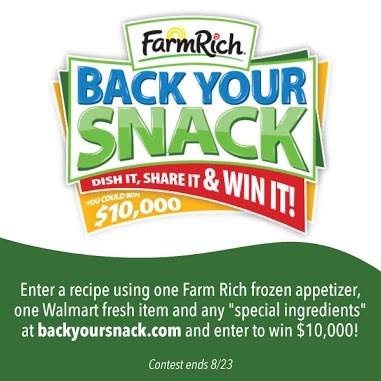 As I mentioned earlier, you can create your own snack hack with Farm Rich products and enter to win $10,000. Here's some info on the contest. Contestants MUST use at least one Farm Rich product and one Walmart fresh item, plus any special ingredients (up to 6 ingredients total) you want to include to create snack hacks between 8/1 and 8/23. The winner will receive $10,000. Please note that the main focus for judging criteria is quality of recipe and use of require ingredients, not quality of imagery submitted. For full contest rules, check out the rule book here. You can find Farm Rich products in the freezer department at Walmart. Here is a list of stores where you can find the upcoming demos of the semi- finalists on 9/19 and 9/20, and the finalists on 10/9 and 10/11.